She graduated in 1972 from the International School of Violin-Making in Cremona, as the first Italian woman violin-maker, under the guidance of Master Sgarabotto. For a long period afterwards she worked in the workshop of Master Francesco Bissolotti, where she had the privilege of meeting and learning from one of the greatest modern violin-makers and restorers – Master Simone Ferdinando Sacconi - during his last few visits to Cremona. 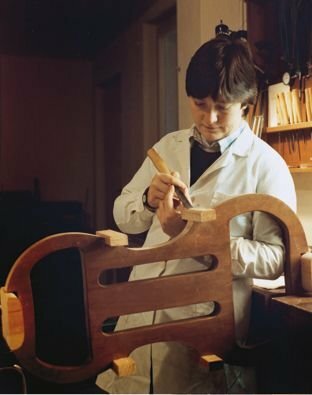 In 1973, on the occasion of the Fifth Triennial Competition of Cremona, she won the gold medal with a prize plaque inscribed: "S. F. Sacconi”, as the best violin-maker under 30 years of age. She builds her instruments according to the classical Cremonese method, with an internal mould, implementing the purfling after closing the harmonic case. In 1980 she collaborated with Master Bissolotti and other violin-makers from A.C.L.A.P (the Cremonese Association of Professional Artisan Violin-Makers) in the implementation of the mobile exhibition "Classical violin-making – the method", regarding the process of building a violin according to the classical Cremonese method. Since 1974 she has been a teacher of practical workshop at the International School of Violin-Making in Cremona.